What It Means When An Editor Says, "Not a Fit"
Imagine you have just built a house and every day someone knocks on the door to suggest a color of paint or some sort of furnishing. One day it's pink and you look around—bathroom, bedrooms, closet—and think, No, pink just isn't right for me, it doesn't fit with the house. It doesn't match how I want the house to look and feel. Someone brings cream, which is fine but not exciting. Another brings purple, which is much too much. So it goes. I'm heading toward the beginning of my fourth year of editing/producing *82 Review and my millionth year of sending out stories and poems (I swear it's true). So I'm on both sides of the submission rejection/acceptance fence. 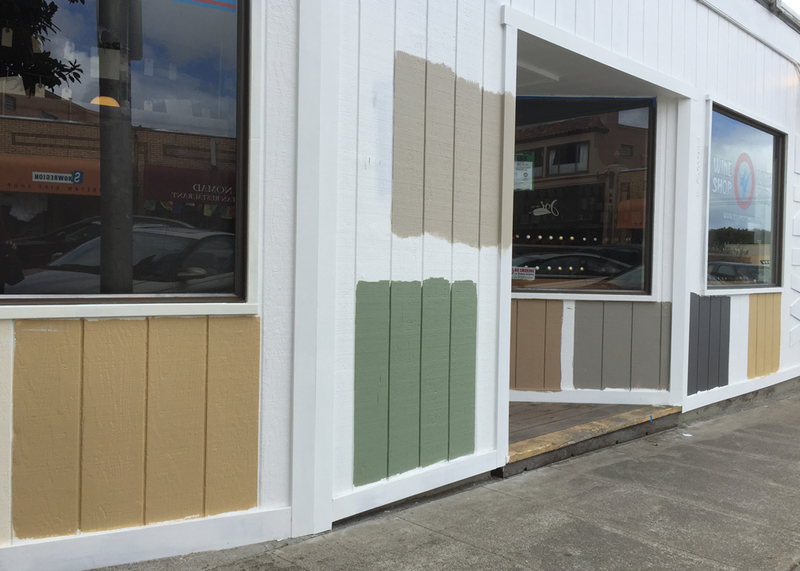 The rejection phrase, "not a fit for our magazine" annoyed me until I came up with the above metaphor of house and paint. Although I don't use those words when I decline a piece, I now do understand it. Each editor has a vision, a house, that s/he is furnishing. Sometimes that poemtable is nice, sometimes even extraordinary, but it's not the right style for the issuehouse. Each submitter also has a vision and style. Sometimes the subject or form matches the editor's vision and style, more often, it does not. Think about your friends, how you met them, the people you met and liked but somehow the friendship didn't gel or you didn't keep in touch. Your piece and the editor need to have the right chemistry and intention for a longterm match. Maybe you've heard that it's all subjective. It is. It really is. Keep writing. Keep sending. Try different places. Eventually, you'll knock on the door that opens to you. And your piece will finally fit. Great post, Alisa! For me, the breakthrough in my understanding of the editorial process came from the editors of ARROYO when they sent a status e-mail for a poem I'd submitted and explained the process of "shaping" an anthology. Ah ha! says I. It's a Gestalt. My poem ultimately didn't make the final cut, but I didn't mind because the editors had taken the time to explain their editorial process. That explanation was a gift. Val Forbes brought me a new binding, a gift for me when she came to my open studio, and I'd like to share it with you. She saw it at a crafts fair in Australia, then found it in the book Live & Learn: Real Life Journals: Designing & Using Handmade Books by Gwen Diehn under the name Flat-Style Australian Reverse Piano Hinge binding (which is just one syllable short of supercalifragilisticexpialidocious). It is true that it employs the mechanism of a piano hinge. It is true that the hinge is inside, and therefore reversed. And yes, it lies nice and flat. Once other people know what it is, I am hoping we can call it Australian Piano Hinge, or at least use that as a friendly nickname. But never mind the name. Let's make the book. You can make a substantial cloth book without sewing or gluing by using the Slot & Tab binding. Cut twenty equal rectangles out of cloth. Place the cloth in a horizontal format. Apply a vertical line of gesso down the center of each. This is how the book appeared before it became Handle with Gloves: Twelve Readings in the post, "Eva Hesse: Visual & Visceral." The original Slot & Tab binding was designed by Michael Budiansky. 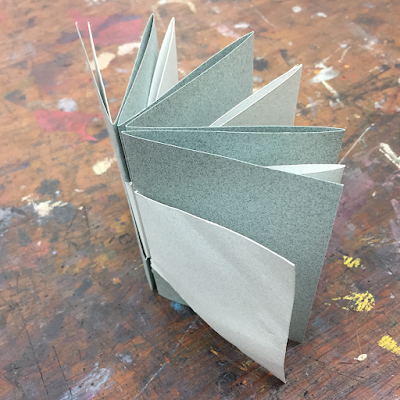 This fall, in addition to teaching bookmaking and letterpress at my home school of California College of the Arts, I've been teaching the Introduction to Bookmaking class at California State University, East Bay, usually taught by Michael Henninger. We visited the Special Collections department in the library there and looked at books I picked out that were both familiar and unfamiliar to me. One 2005 book, (I Want a) Prenup by Petra Press, utilized a structure I had not seen before: two eight-panel accordions that interlocked, much like Slot & Tab (in Making Handmade Books). The design of the pages makes excellent use of the mix-and-match effect of the structure. 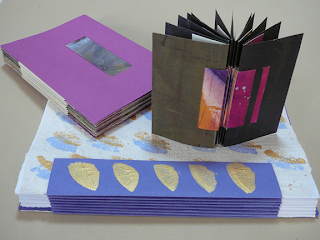 Petra Press, on the Vamp and Tramp website, describes it as a "double accordion book." The playfully woven designs on the page clearly took quite a bit of time, thought, and careful planning.